An international group is going to erect greenhouse gas-monitoring center atop the Sierra Negra volcano in central Mexico. The Washington-based Climate Institute and other foundations and companies have raised the initial US$1.9 million (1.4 million EUR) to pay for the station, which will join a worldwide web of similar labs at lower altitudes measuring air particles, radiation and gases such as carbon dioxide. "The importance of having it high (in altitude), rather than low, is that you can get the global picture. For that reason, you go as high as you reasonably can," said Sir Crispin Tickell, Britain's former ambassador to the United Nations and a longtime advocate of confronting climate change. Centers closer to sea level may capture local pollution variations, Tickell noted, while the windswept, 4,581-meter (15,117-foot) Sierra Negra mountaintop is further removed from such variations. The station will bear Tickell's name when it goes into service sometime in mid-2008, said Luis Acosta, the Climate Institute's director for Mexico and Latin American Affairs. The center - which will be one of dozens that contribute to the World Meteorological Organization Data Center for Greenhouse Gases - will stand near the Large Millimeter telescope, considered the largest of its kind. According to the World Meteorological Organization Web site, the network of current greenhouse gas observatories include the Mt. Waliguan station in China, which stands at 3,810 meters (12,575 feet), and the Niwot Ridge, Colorado station, at 3,475 (11,467 feet). 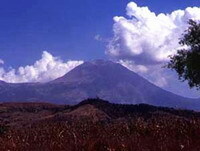 The Sierra Negra is one of six Mexican volcanos that are higher than any peaks in the continental United States. The station's initial array of instruments will measure aerosol particles and ultraviolet radiation, with additional measuring equipment for greenhouse gases and fluorocarbons expected soon. Acosta said the U.S. National Oceanic and Atmospheric Administration, or NOAA, would participate in the project. A spokeswoman for the agency, which is involved in similar monitoring efforts around the world, was not immediately able to confirm its participation. On Monday, U.N. Secretary-General Ban Ki-moon launched an international summit to build momentum for future negotiations on cutbacks in emissions of carbon dioxide and other manmade gases blamed for global warming.